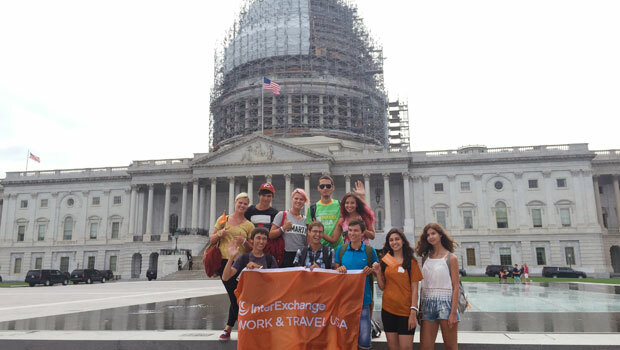 Work & Travel USA participants visit the U.S. Capitol. Cultural exchange occurs when people gain a deeper understanding and knowledge about another country, its culture, its customs and its day-to-day practices through person-to-person contact. Both our participants and hosts embrace this aspect of InterExchange programs and understand its importance whether they’re part of a camp, a family, a seasonal business, or a professional environment. The United States is often described as a melting pot, attracting people from countries all over the world. It is a culture that is continuously being reshaped and redefined as more people from other countries gain exposure to the country. It is also influenced by visitors who share their cultures during their time in the U.S., and by the deeper insights and favorable attitudes about American life they bring back to their home countries. InterExchange makes it a priority to give our participants and hosts resources to explore cultural learning opportunities together or independently. We’ve created an online guide to U.S. culture, including recommended sites and activities for everyone to enjoy while in the U.S. We encourage everyone to discover new places and aspects of American culture, whether they’re visitors or natives! The InterExchange Inside the USA guide also contains many helpful recommendations and resources. Also check out Cultural Compass, our state-by-state guide to activities, culture and sites in the U.S., and share the link with your participants. Welcome to the U.S.: Host a welcome reception for Summer Work Travel participants and introduce U.S. culture. Suggested materials: name tags, sign-in sheet, American culture speech balloon, icebreaker games, cultural bingo, flag frames, American culture trivia. First day of work: Orient participants to the workplace and allow time for participants to get to know their colleagues. Use icebreaker games to help people get acquainted. Suggested materials: name tags, sign-in sheet, American culture speech balloon, icebreaker game, cultural bingo, flag frames, American culture trivia. Throughout the season, cultural events and outings are a great way to keep up enthusiasm and morale at your business and to make sure participants are experiencing American culture. Participants may feel homesick at some point during the season, and facilitating fun activities can help remind them why they're here. Sporting event: Organize an outing to a local sporting event. Help explain the rules of the game if participants are unfamiliar. Suggested materials: Name tags, sign-in sheet, American culture speech balloon, baseball rules handout, "Take me out to the ballgame" (baseball only). Karaoke: Organize a karaoke outing. Encourage participants to sing and discuss their favorite American songs. Suggested materials: Name tags, sign-in sheet, American culture speech balloon, icebreaker game, cultural Bingo. Also take a look at our American music suggestions. Food events: Host an American-style barbecue or picnic, or organize a potluck where students prepare their favorite dishes from their home countries. Suggested materials: Name tags, sign-in sheet, American culture speech balloon, recipe cards, ice breaker game, cultural Bingo, flag frames. Visit a local museum or concert hall. Suggested materials: Name tags, sign-in sheet, American culture speech balloon. Attend a local holiday parade or festival. Suggested materials: Name tags, sign-in sheet, American culture speech balloon. Farmer's market outing: Encourage participants to find something they've never seen before. Perhaps they'll even want to purchase and eat a new vegetable! Suggested materials: Name tags, sign-in sheet, American culture speech balloon. Employee birthday: For many students, this may be their first birthday away from home. Help make it special by organizing a party or gathering with colleagues. Suggested materials: name tags, sign-in sheet, American culture speech balloon, icebreaker game, cultural bingo, flag frames, American culture trivia. Trivia night: A great mid-season event idea is to host a trivia night! See how much participants have learned about American culture by using the trivia questions we've prepared. Suggested materials: name tags, sign-in sheet, American culture speech balloon, icebreaker game, cultural bingo, flag frames, American culture trivia. Movie night: Organizing a movie night is a simple way to integrate more American culture into students' experiences. Check out our suggestions for American movies and TV shows. Suggested materials: name tags, sign-in sheet, American culture speech balloon. Celebrate an American holiday: Celebrate holidays like the Fourth of July or Thanksgiving to give participants unique insight into American culture. Picnics and potlucks work well for holiday celebrations. Suggested materials: Name tags, sign-in sheet, American culture speech balloon, recipe cards, icebreaker game, cultural Bingo. Pumpkin carving contest: Print out templates for participants to use and have fun carving pumpkins together. Suggested materials: name tags, sign-in sheet, American culture speech balloon. Volunteer event: Get students together for a day or an hour of volunteering! Partner with a local volunteer organization for greater interaction with Americans. Suggested materials: name tags, sign-in sheet, American culture speech balloon. Explore nature: Go hiking, kayaking or take a nature walk. Suggested materials: name tags, sign-in sheet, American culture speech balloon. Cultural scavenger hunt: Organize this fun game to help students learn about one another's cultures. Suggested materials: name tags, sign-in sheet, American culture speech balloon. Game night: Bring board games like Apples-to-Apples, Monopoly, Pictionary, or Scrabble. Suggested materials: name tags, sign-in sheet, American culture speech balloon, icebreaker game, cultural bingo. Have an end-of-season raffle where students can win American products like chocolate bars, baseball cards and other small gifts. Self-addressed postcard. Have students write a note to themselves so they receive it when they returned home (e.g. what they learned during their time in the U.S., favorite sites, English words and phrases). Suggested materials: name tags, sign-in sheet, American culture speech balloon, icebreaker game, cultural bingo. International staff can be more likely to encounter some difficulties adjusting to living and working in the U.S. Culture shock is defined as the psychological shock of having to adjust to new surroundings and a new culture that may be dramatically different from one’s own. A student may soon realize that the familiar signs of home and the automatic responses used to meet situations of daily life may not be applicable. Climate, food, landscapes, people and their ways may all seem strange. English ability may not serve the students as well as they expected. They may feel the pressures of fast-paced life at a busy resort area in the U.S. Because our students are here for a relatively short time period, the degree of culture shock is usually quite minimal; however, employers should expect a short transitional period while students “warm up” to their new situations. InterExchange Work & Travel USA students experience culture shock to varying degrees; some hardly notice it at all, while others can become overwhelmed. Many may not attribute their problems to culture shock. Whatever the case may be, being sensitive to these issues will benefit you and your students. If at any time you require assistance in dealing with any cultural misunderstandings that may arise, please do not hesitate to call the InterExchange Work & Travel USA program staff. Students may feel isolated and frustrated. They may become nervous and/or excessively tired. They may sleep a lot, even after they have recovered from jet lag. Students may be excessively homesick. It is normal to miss home, family and friends; but if they can think of nothing else, call or email home all the time, or frequently seem depressed or cry, they are most likely suffering from culture shock. Normal, minor irritations may make a student overly upset. Students may become dependent upon other students from their home country. These friendships are important and are extremely supportive. However, if they spend time exclusively with students from their home country, they deny themselves the experience of interacting with people from the U.S. and other countries. InterExchange makes every effort to separate students from the same country as often as possible so that they can more fully immerse themselves in the language and culture of the U.S.
Students may have deep doubts about their decision to come to the U.S. There may be anxieties with work. A student may wonder: “Why does my boss speak so loudly and quickly?” “Will I be able to repay my parents the money they lent me?” This stress can become overwhelming and cause tension. They may feel reluctant to speak English or to associate with people. Maintain your perspective. Although the students are your employees, they will occasionally need advice or encouragement. Usually students just need to know they have someone on their side to help boost their confidence while adapting to their new environment. If a student feels confused or disappointed, ask them what their expectations were. InterExchange Work & Travel USA gives detailed descriptions during interviews to prepare students for what to expect when they are in the U.S.
Keep an open mind and a sense of humor. People in the U.S. may do or say things that people in the student’s home country would not do or say. Try to understand that the student is acting according to his or her own set of values, and that these values are born of a culture different from yours. Review the Cultural Compass section of our website for recommendations of sites and activities that your students can enjoy. Read our section on Culture Shock for more suggestions to help students cope with the transition.